Way back in June 1995, I took a 3 week class at one of my local quilt stores. It was an intriguing class .. a Quilt of Borders. 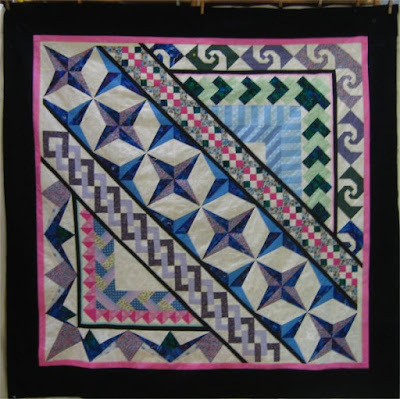 The concept was a sampler of pieced border blocks, set into an attractive layout. I"m thinking that this was before rotary cutters came out (or were in wide use) because the pattern included hand-drawn templates by the instructor, Patty Barney, which we traced onto and cut out of template plastic, then used to trace onto the fabric and cut the fabric out. I used strictly stash fabric for this class project and I remember being exceedingly pleased with myself with how nicely everything was turning out. The pattern was in 3 sections: a diagonal center stripe with a large triangular section on either side (an upper triangle and a lower triangle). Each of the 3 sections was made up of several different pieced border blocks. One triangle section was comprised of Snail's Trail, Card Trick and "shading". 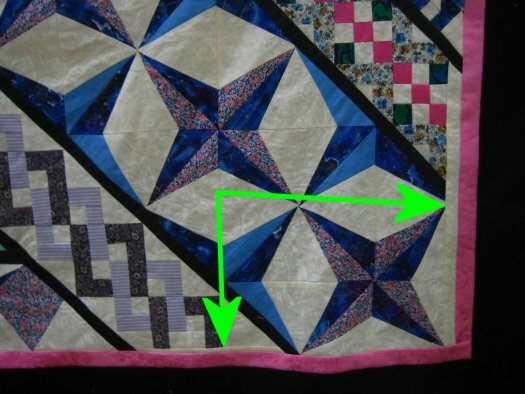 The Snail's Trail and Card Trick blocks are probably familiar to most quilters. The "shading" blocks aren't a pattern, per se, but was an exercise in getting the right shades of color so that the total effect looks 3D. To get *this* particular effect, I used the *wrong* side of the blue polka dot fabric as the light fabric and the "right" side of the fabric as the dark fabric. You're buying both sides of a fabric, so if the "wrong" side is more appropriate to be used, then use it! 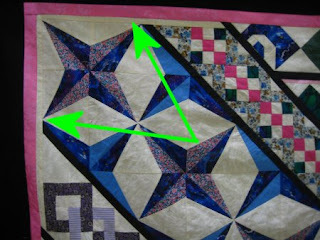 The center strip was made up of 3 sections ... Chain Links, "stars", and 9-patch blocks. The last class was when we finally were to assemble the 3 sections together ... sewing the upper and lower triangles to the center diagonal. I pinned each section to each other, centering them and working outwards to the edges. THAT'S where I ran into problems. Each corner of the diagonal center section was *short*. AARRGGHH. I was about one inch shorter than it needed to be. It could have been the hand-drawn master template pattern. It could have been my tracing of the template. It could have been inaccurate cutting .. or sewing ... or pressing. Or a combination of any of them. I don't know. All that was obvious was that all 3 of my sections were NOT going to match up at the outer corners. That made me very, very, very discouraged. I didn't know how to fix it. The correct solution would have been to remake the offending blocks .. but I'm sure that I didn't have a whole lot of excess scrap fabric. So, I just folded it up and put it away. Occasionally, I'd "rediscover" it when I reorganized my sewing room, but I'd just fold it away again. Until now. I have a UFO board and over the years, I've been trying, very diligently, to work on the projects on the board. There were times when I was on fire .. boy, those project got finished .... and other times when they were just uninspiring. Couple that with being distracted by NEW! SHINEY! projects I'd see in magazines or online ... or family quilts that needed to be made NOW ... and that UFO board never quite seemed to get smaller. Let's fast-forward to now ... I was at a prime point in time to work on the UFO board again. I chose the Quilt of Borders because I *knew* just how close it was to being finished .. if only I could think of a solution. It being 21 years later (yes, I'm very, very good at procrastination), I have a different point of view than when I first started. Now, I'm more lenient about "creative solutions". Now, I'm more flexible if the quilt doesn't turn out EXACTLY as it was to have supposed to have been. Part of that is having all those intervening years of *having* a good number of excellent quilts being completed. I no longer feel compelled to make sure that every quilt is a masterpiece. That isn't to say that I do sloppy work, but if the solution to a problem is less than a show quality quilt, then I'm really OK with it. And that is exactly the solution I came up with for this problem. I needed to have extra fabric at the outer corners of the center diagonal strip. If I didn't have extra fabric 21 years ago, I sure wasn't going to have any now (although I did look through my stash inventory, to no avail). What I did find, however, was a similarly hued fabric to the background fabric. I "filled in" the shortfall with strips of the new fabric. Yes, if you look at it, you can certainly tell. (the green arrows are a hint!) No, I don't think it looks terribly obvious. Go back to the picture of the whole quilt at the top of the page ... if you didn't already know those strips were at the corners, are they really THAT obvious? ?